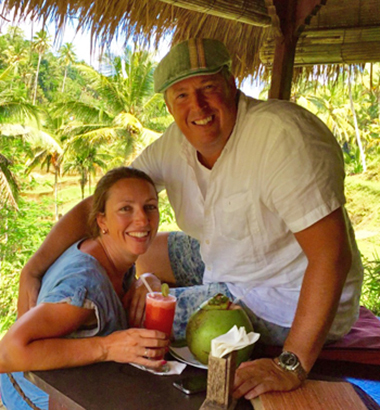 We are Ralph and Joyce van Rooten from Design Villas Bali, we rent luxury villas in Bali for ourselves and other villa owners. After my 14-month world trip, I met Joyce 15 years ago and we started our company in dishware and home accessories. 22 years ago, I first came to Bali for the first time and since then have traveled more than 40 times both for business and private reasons. In recent years we have built several luxury villas, both for ourselves and for third parties. We have given it our everything, not only in terms of design but also the setup of these unique villas and the corresponding tropical garden. It isn't just a holiday get-away, it is a place for you and for us, where you will feel safe and can enjoy everything Bali has to offer. The peace of Eastern Bali and its beautiful nature as well as the authentic Balinese town of Tumbu with its beautiful sights has captured our hearts. This beautiful place close to the sea and the beautiful beach of White Sand Beach and countless of places of interest makes its a very good starting point. We are very excited about the villas and the 5 star service of the staff, which all contribute to realizing the perfect holiday. When you finalize a booking, you will receive more extensive information about the things that can be done as well as practical information about the villas and surroundings. If there is any information that you can't find back on our website or on the information sheets, don't hesitate to contact us. We will gladly help you realize your dream holiday. We hope you will enjoy Bali as much as we do. Dream Villas Bali is a feel-good company that was founded in the year 2009 in the small, peaceful farmer village of Tumbu, Karangasem, on the east coast of Bali. As a feel-good company, we believe in social entrepreneurship and we are certain that, when we pamper our guests, we can only do this when our staff is able to make sure that there are no more big worries. We take care of our staff in the way real Balinese families do. In 2009 we started with only 3 employees, in the mean time 11 villa's have been realized in Tumbu by Dream Villas Bali and 40 Balinese families are earning an income through our activities. For us it is a dream that has come true.